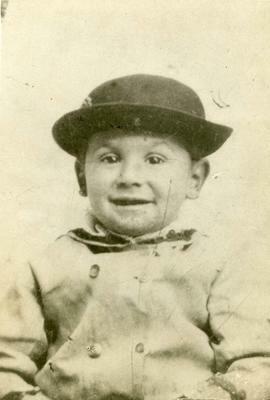 Photograph depicts C. B. Sylvester posing in a bowler hat at two years old. Written on verso: "C B Sylvester - 2 years old". Clarence B. Sylvester died in the street of a heart attack at age 50. Photograph depicts an unidentified boy standing on a bridge in a photo studio, holding what appears to be the reigns of a sled. Photograph depicts Cecelia Sylvester with one of her daughters. 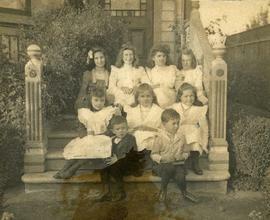 Photograph depicts a group of people posing for a photo on a porch.